What is it about an Easter Egg tree that just brightens up a room during the holiday? There are a number of ways to create your own Easter egg tree — from using natural branches (as seen in these photos) to painting twigs or using silk branches that can be used year after year. This post contains affiliate links. People are used to seeing decorated Christmas trees before and sometimes long after the holiday has passed. 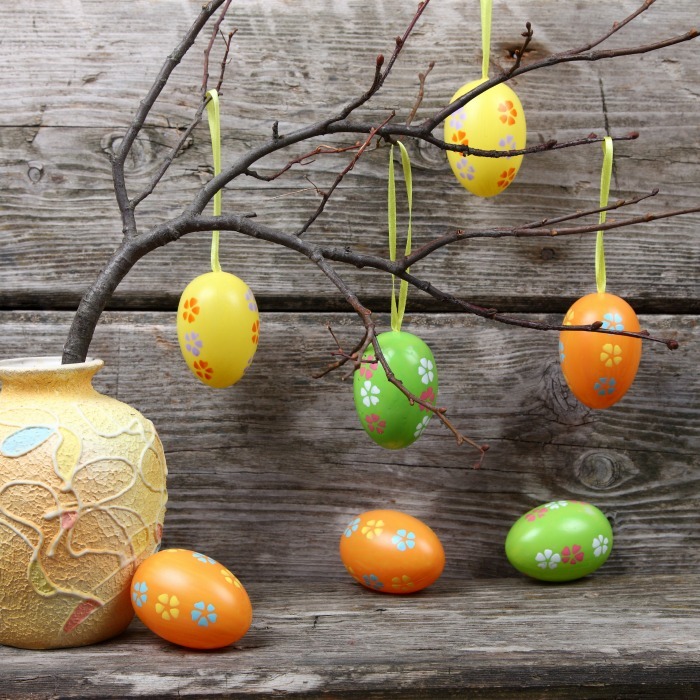 In recent years, you may also have seen trees decorated with eggs outdoors at Easter time. 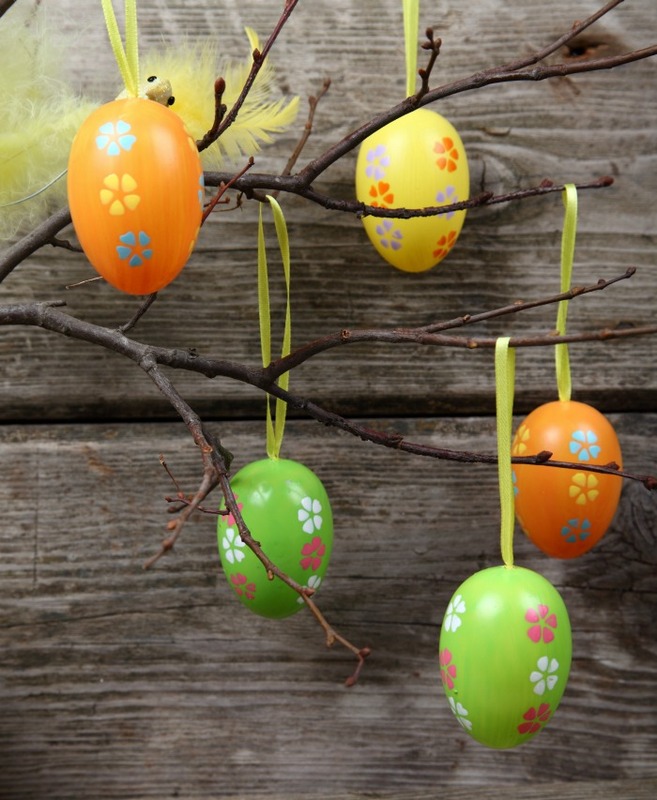 But here’s how to make your own Easter tree to decorate your Easter table. You may not want to put an entire tree on your furniture, but you can create a smaller version of it. Step 1: Start by finding a branch of a tree with several small limbs. You can either the leave the tree its natural color or you can spray-paint it. Step 2: Find a planter or bucket where you can “plant” the tree. This can be spray-painted and then decorated if you like. Fill the planter or bucket with plenty of sand to be heavy enough that the tree won’t topple over. And trust me, it will topple over if you don’t weight it down. Push the branch down into the sand to secure it. Step 3: Poke silk flowers into the sand to hold them. Feel free to put Easter grass around the base so it looks like the tree is actually growing. If your child has small stuffed animals such as a lamb, chicks or rabbits, they may want to place one or two of them at the base of the tree. Consider buying a small animal to place with the tree and then give it to your child as part of their Easter gift. Step 4: Cut several pieces of ribbon, enough for each ornament or egg you’ll be hanging. Ribbon looks so much more lovely than using straight string. You may want to see if you can find small springtime or Easter-themed ornaments. If you can’t find anything you think is appropriate, your children could make them or you can simply hang plastic eggs from the tree. What types of ornaments could your children make? They could draw pictures associated with Easter on construction paper and cut them out to decorate the tree with. They could draw eggs and decorate the eggs using markers or stickers, lambs, crosses, lilies, birds, or anything else they might like to use. You may want to have the children write out Bible verses and place them on the tree to help them remember the meaning behind the holiday. Some families use the Easter tree to hang Easter candy rather than using a basket. Wrap string around the filled plastic eggs and then tie them to the branches. You can also tie a ribbon or yarn around chocolate eggs or bunnies. Once you and your children learn how to make your own Easter tree you may decide it’s something you’d like to add as a family tradition. Each year you can make new ornaments to add to the tree. However you decide to use your Easter tree, enjoy the time you spend with your children making the tree this year as well as this beautiful centerpiece. Find more inspiring and fun Easter crafts and recipes on The Jenny Evolution! I love Easter Egg trees. I used to hang eggs on our outside tree, but I think I’ll try something like this for Easter this year. Saw your link at the Two Cup Tuesday party. I love this idea! Since my kids always want to decorate the Christmas tree, I’m sure an Easter tree will make them very happy! If you have time, come and share this post over at the Really Crafty link party that is live right now! (http://keepingitrreal.blogspot.com.es/2016/02/welcome-to-really-crafty-link-party-8.html). This is so, so adorable and I adore the cheerful nature of this Egg Tree! We would so love for you to share this or any other of your creativity with us at Thoughts Of Home On Thursday! We’ve always had easter trees but I’ve passed all our home-made ornaments down to my daughter to share with her kids. Thanks for bringing back the memories! Thanks for stopping by Throwback Thursday! We can’t wait to see what you’ll have for us next week! So cute! I love Easter. You will be featured on Good Tips Tuesday this week. Thanks for linking up. Thanks so much, Erin! I always love sharing something that’s a little different… and easy! Fun little Easter tree and so inexpensive to make. Thanks for sharing at DI&DI.